My son, like all kids his age, brings home thousands and thousands of pieces of paper. Most of these papers have scribbles or paint or glitter on them. Occasionally there is glue and what remains of whatever was stuck to the glue(Glue use must be supervised by the teacher. You cannot just give a three year old a bottle of glue and walk away. Serious shenanigans often result.). The mass of paper is kind of appalling; his daycare appears to be sending home a tree a week. However, this is my precious baby boy, and all these scribbles just reveal his inner creativity, so I must save every scrap! My mom didn't save every single item I ever brought home. She saved a piece of string art that I did when I was five(you dip a piece of string in paint and then put it on a piece of paper and fold it). She decoupaged it onto a piece of wood, which was pretty cool of her. But most of my 'masterpieces' went into the trash, because we were in the military and moved often, and the military makes you meet weight requirements for your stuff. 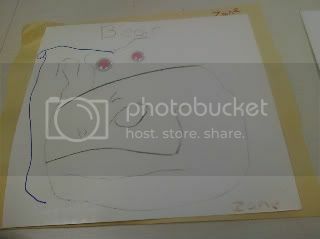 It does sort of look like a bear, although I don't think that Zane is the one who put those googly eyes on the page. What likely happened is the teacher put the eyes on the page and then let the kids do their thing. Maybe it was supposed to be something else and Zane winged it. Whatever, it's a cool picture, I think. I can't imagine how his teachers manage to get him to sit still to complete art projects, since I haven't seen my son sit still and color longer than two minutes. Zane's constant movement is just a boy being a boy, I've come to realize. Girls explore their world through language, boys explore their world through movement. I've got a typical boy doing typical boy things. When he starts kindergarten, I pray that he gets a teacher who understands that need to move around, that need to explore through movement. If he gets that kind of a teacher, he will blossom. I think that's a pretty cool picture!